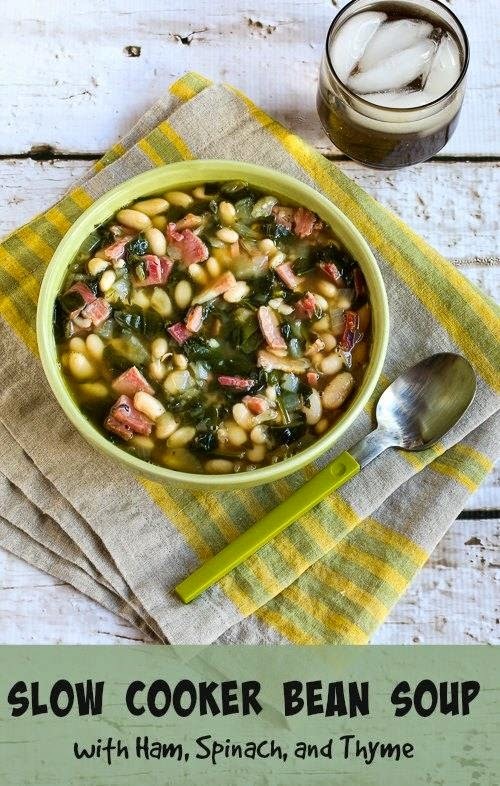 Cook beans in the slow cooker or use canned beans for this Slow Cooker Bean Soup with Ham, Spinach, and Thyme. Want to know one of my favorite tricks for increasing the nutritional value of most any kind of soup? Add some greens! Dark leafy greens are the the most nutritious foods per calorie of all the world's healthiest foods, and the flavor of leafy greens goes with so many other foods. This Slow Cooker Bean Soup with Ham, Spinach and Thyme started with leftover ham from Thanksgiving and dried beans in the pantry. Once I had the idea in mind, all I needed was a package of baby spinach and by the end of the day I had this delicious soup.